Great post Rhonda, totally agree, I have envirosax as well and they are great, as you say, fold up to practically nothing and fit in a pocket, handbag,anywhere. I'd like to add another thing to your 'campaign' on plastic etc thingumyjigs, and that is those wretched helium birthday balloons that everyone seems to have these days. Please please people, don't do it, they end up on our beaches and all over the place and are as much a hazard as Rhonda's (not) plastic bags! Totally agree on the balloon thing. Why do people think its ok to let a load of balloons go? Where do they think they'll end up?! Not to mention helium is a finite resource and I'd much rather it was used as a supercoolant in MRI scanners than wasted in balloons! I use hessian bags and bags that I make myself, I just make sure that the handles are strong. Plastic bags have been charged for in Wales for a few years now and you do not see them littered anywhere. I think that it is past time that they were phased out completely. OK, I have to ask. Your links, and your post, mentioned one single reusable bag (some links said maybe two) in your purse/trunk/etc. May I ask how shopping is different in Australia than it is in the U.S. that one bag is enough for a trip? We use no less than 8 bags when we shop for a week's groceries. I have 2 children, so we don't have a huge family. Just wondered if you guys shopped daily or every other day or how 1 bag would ever be enough? We use reusable bags as well. It's not a big thing we were live and I have gotten the occasional odd look, even at stores that sell the green ones. But it's becoming bigger and bigger. Hi 'Our Family is HIS". We aren't so different in Australia. Everyone shops differently due to choices and size of their family. Having 1or 2 enviro bags always in your handbag just enables you to have a bag when doing a small grocery shop, errands etc. In Rhonda's case (hope you don't mind Rhonda), but from her previous posts, she grows much of her produce needs, does her shopping from different places at various times - e.g. local dairy when driving past, nuts & dry goods ordered elsewhere, Aldi groceries......So, like many others, one bag may be sufficient or when stockpiling either more bags or a trolley to the car is used. For myself and my father - I carry an enviro bag, use a cooler bag when buying meat from the local butcher, box always in my car boot (& some bags) for the green grocer, and multiple 'green bags' when shopping at the supermarkets. I'll be trying out some netting type bags suggested by others for the produce shopping as it will be easier than rounding up the loose items and keeping them from rolling off the weigh scales at the checkout! Cheers from cold Victoria, Australia. Thank you for the clarification. That makes so much sense. I detest those plastic bags, too and agree with you entirely. I have my bags all folded into one bag and in my van. I have them on the floor right below where my purse rides so that I see them when I exit the vehicle. I have some insulated bags that I really love for cold foods too but I have to watch and tell the bagger to use them for the cold items. Some of our local stores give a nickel off your shopping order for each bag you bring into the store. Aldi charges for bags and I think more stores should do the same or even outlaw them and go bag to paper if nothing else. What will dog owners use to clean up after their pets? Newspaper, old brown paper bags, pages from old magazines etc. Yes, maybe. But I bet a lot of people will buy special purpose baggies made of plastic. That's the point of this post, sara. Everyone makes a choice when they accept or buy plastic . ah, I see. So, a choice then. I'm not trying to be contentious, really. I just see how many people think that a simple answer is a "silver bullet." When we had a dog I used to tie a bread bag on to its leash and then use that to clean up the doggie doo doo's. OH and, I remember, and I bet a lot of you do too, how in the 1980s plastic grocery bags were touted as better for the environment because they aren't made of tree. Forgive me if I am skeptical of supposedly environmentally-friendly fads. What you see as a fad I see as a response to behaviour that's gone on so long, we no longer question it. I don't know how you explain the buildup of plastic in the oceans and landfill sites or what we can do about it but I think that we all have a responsibility to do our part in not accepting the bags. We can't do anything about the bags already in circulation, they'll all be there for hundreds of years after we die, but I can do something about what had not get been used. Please don't mistake me - it's good to be careful about resources, and maybe avoiding plastic grocery bags is an easy and good thing to do, but I suspect the truth is more complicated than can be solved by passing laws and sitting in moral judgment on people who make different choices. As an example - perhaps in 15 or 20 years we'll hear all about how the banning of plastic grocery bags led to increased production of plastic garbage can liners - which people might be able to do without in certain rural situations, but try putting out trash without a plastic bag in New York City or its suburbs. I'm not judging anyone. I'm saying that now we know the harm plastic bags do in the environment we live in and in the oceans, we have the choice to change from blindly accepting them. This is not difficult. It's easy for all of us to make or buy shopping bags. We have to resist the habit of accepting bags. What happens in 15 or 20 years time is irrelevant. We all have the choice to help change this now. You either do it or you don't. I still don't understand why people need to line their bins? Is it really that hard to carry a bin out and empty it? We live in the CBD in Sydney and we cope without plastic bags. I think it's something we've been told we 'need to have' in order for someone else to make money. We need to challenge the status quo and question why we automatically line a perfectly good receptacle with a plastic bag. Sara's right in that it's no good people refusing free plastic shopping bags if they simply switch to purchasing plastic bin liners (though people seem to be more respectful of things they pay for and less likely to simply dump them in the street). We need to avoid disposable plastic products, or demand biodegradable plastics made from corn starch etc. I don't see how you can say that what happens in 15 or 20 years is irrelevant. We are living with the consequences of choices made in the past, so what we do today affects tomorrow. And all I'm saying is that the choices we make are not made in a vacuum, there is context. *sigh* Either I'm not communicating well, or we just disagree. Either way, I'm glad to have had the conversation with you. "We are living with the consequences of choices made in the past, so what we do today affects tomorrow." Exactly. The future starts today. I'm not sure I understand your argument. You started by saying you're "skeptical of supposedly environmentally-friendly fads." and now you seem to be backing off from that. What ever your choice is Sara, I respect your right to make that choice. My guess is that it's different to my choice. Now I have to go back to my writing. I live in South Australia and we have had legislation in place banning light weight plastic bags in supermarkets for a few years now. It really is easy to adapt to. Our family uses material bags to buy groceries, I keep a few small reusable bags folded up in my handbag and keep a few in the car "just in case". For our bins, we use biodegradable bin liners. Easy. Sara, here in Australia, we can buy bin liners that are biodegradable, I think they're made of starch. They last long enough to hold your garbage in the trash can but break down completely in the next few months. We also have "wheelie bins" to put our garbage in - they are large bins with wheels and lids that get put out on the street curb and there are garbage trucks with special handles that drive along, pick up the bin and empty the contents into the back of the truck. This way, you can tip the contents of your home trash can / bin straight into the wheelie bin, without the need for a liner if you so choose. In much of America, I suspect, people still have to put their garbage in black plastic bags at the end of the driveway for the garbage collectors, which means there isn't a choice about using a bag. I've heard the argument before against banning plastic shopping bags, that it's a "feel good" thing that doesn't really address a lot of the environmental issues that ALL of the plastic in the world creates, but sometimes we have to start with small steps in order to tackle the bigger ones. If everyone thought more about avoiding as much disposable plastic as possible, the world actually would be a better place. Perhaps making our own re-usable shopping bags is distracting us from the bigger issues, but it certainly isn't hurting the environment, especially if we're mainly re-using existing materials to make them out of. I have a pretty floral fabric bag in my handbag for purchases. The rubbish that my family of five generates fits into three BREAD bags most weeks. Yes the bag that a loaf of bread comes in. It just requires a small change in thinking. Just to add my tuppence worth! A plastic bag as a bin liner will, yes, go to landfill adding extra, but it's not about to float off down the street either ending up harming wildlife on land or sea, or 'just' making your street look horrid. You could also say that it is putting that fossil carbon back underground where it belongs, at least it won't get burnt putting the carbon into the atmosphere. Banning bags or making you pay for them would reduce the amount of bags let loose. They would be used and disposed of carefully - probably wrapped round your rubbish or *shudder* dog poo!! A note on degradable bags, the problem with those is in landfill they degrade anaerobically and therefore produce methane which is far worse a greenhouse gas than carbon dioxide. Oxo degrade able plastic might be the way to go. That way if it's out in the environment, flapping in the wind stuck in a tree *sigh* it will degrade, but underground in landfill it won't. I used to know a (very) old gentleman who treated plastic bags with reverence. He collected them, folded them carefully and stored them according to size. He thought they were a small miracle - something that the stores gave away! For free! He used to discuss the quality of different bags, what he could use them for. But, ultimately, he always came back to the fact that the stores gave them away for free. See, he was from the generation where resources were treasured. The idea of something "disposable" was beyond his thinking and the bags were seen as a gift with the item purchased. I always try to remember his attitude when tempted by disposable stuff. The concept was just beyond his thinking. I've been using fabric bags for years now. On the rare occasion I will use a plastic bag, but those get reused as a liner for my bathroom trash. Well done for using your own shopping bags! I grew up with this type of shopping attitude, so always go prepared with several of my own bags. I also use a small shopping trolley I can fill with most of my weekly shopping requirements. I never use plastic carrier bags from the shops and don`t have the need to pay for any either. If you train your mind set to always go shopping with your own bags you eventually create a positive attitude and it becomes second nature to grab your own bags before heading out to the shops. It`s just a matter of positive habit building. Everyone can do it if they are truly committed to looking after the planet. We have tried many times to convince our customers to use cloth bags! We've held classes on making your own totes, we stock patterns and have even given away some fairly pricey bags in the hope people would bring them back in. No other business in town does this, and rarely do one of our bags come back. So we use recycled brown paper, and at holidays colored bags they can re-use for gifting. We ask "Do you NEED a bag for that?" And some of our customers will tuck small purchases in their purse, or if it's a stack of fabric, just carry it out. I keep two totes in my car, one for dry goods and one for meats and freezer items. We will do another 'bag give-away' at our Fall open house in September - maybe some of those will make it back - with luck. I used to live in the ACT and still shop there regularly. They have some law about single use shopping bags which I heartily applaud BUT the application of what is 'single use' seems to be very inconsistent. Some shops you go into automatically put your stuff in (what looks to me like the usual type) plastic bags, others ask you if you need a bag and offer to sell one, others just cross their arms and glare at you and say 'you didn't bring a bag'. If you're going to have some high moral ground, I think there needs to be some consistency. Like you, Rhonda, I carry the lightweight woven bags that fold up to nothing (I bought a set of 10 in an envelope thingy from a major supermarket) and they are the best thing ever. But once in a while, I've used up all the bags I brought with me and buying another polyester (lasts for hundreds of years) reusable doesn't make any sense either. We don't have municipal garbage collection here so I'm very aware of how much rubbish we produce but surely there's some middle ground between all or none. I'm just not sure where it is. I live in Canberra and I remember it took about a year for both people and shops to adjust once the ban came in. These days your only options are to either buy a plastic bag for something like 15c (they are bigger and sturdier than the old grey ones) or BYO. Sometimes I forget to take the bags in with me when I shop, which really irritates me. My poor kids find themselves laden with things to carry or I manage to wedge it all around my daughter in her stroller. I'm always bemused when I go to Sydney or Melbourne at how my shopping will automatically go in a bag, even if it's just one small item. My sister-in-law couldn't understand why I kept refusing bags. As she lives in Melbourne she wasn't aware of the ban here and sadly had never bothered to think of any environmental problem with having them. Hi Sara, my only problem with the ACT system is that is NOT consistent and bring or buy are NOT the only options. There are still lots of places including food outlets and other retail places that automatically put your purchases in plastic if you don't offer them a bag of your own, and the plastic bags they're using look no different from the occasional one I get in a NSW supermarket. I'd also challenge the idea that the 15c ones are sturdier as I find the 'achilles heel' of those is where the handles join and they don't seem to last me any longer than 'standard' supermarket bags. It's the inconsistency that bugs me, and the 'holier than thou' approach of a couple of retailers at the Fresh Food Markets who used a very accusatory tone and didn't even offer to sell me a bag. I asked for my money back and left without $110 of their products. I could not agree more, I do exactly as you, a few bags in my handbag, the rest in the car. In addition I will be making my own fruit and veg bags out of old sheer curtains soon, to further reduce my use of plastic. To me it seems almost selfish and arrogant of us to use a plastic bag sometimes only for 5 mins to carry our purchase to the car only to throw it out when we get home, we have to start thinking about the bigger picture. This is something I have struggled with in the past (and in the present, actually) Like you said, it really is a simple thing to do. It just a matter of building the habit of making sure that when you leave the house you are taking the bags back out with you to the car. Then it's the matter of making sure the bags actually go with you in the store. So many times I've forgotten my bags in the car and used paper or plastic. Whole Foods gives you a 10 cent discount for every bag you use for your groceries! I love that. For so long I used paper and plastic because I would tell myself that we need them for cleaning out the cat pan, or lining our wastebaskets. That's silly, there are other ways around this. I have one of those small, folding bags in my handbag as well. That way it's always there if I need an extra bag. I use the 'green' shopping bags for my big grocery shop. On the odd occasion that I forget my green bags and need to get plastic bags, I reuse these as my bin bags at home. I made a couple of denim shopping bags for myself a few years ago based on the 'ghastly green shopping bags' pattern. I love them and they are still going strong. It's been on my mind a lot lately to make more. Did you know Tasmanian retailers by law will not be able to supply plastic bags from the 1st November this year? I'll need more :) Thank you for your blog. I love it! Great news, Lisa. Finally another state will be on board (South Australia already has legislation to this effect). I decided against plastic bags and haven't brought a single plastic bag home for about a year now. I hate seeing people placing 3-4 apples in those thin bags at the isle and then placing all those individual bags into another grey plastic bag at the checkout! What a waste! I also gave up bottled water 7 months ago. I think I saved about 30 bottles from being purchased and heaps of money too. Hi Rhonda - I have struggled with this, I have those "ghastly green shopping bags" with a pink and purple thrown in and one of the hessian style bags. I tended to leave them at home by accident and then have to buy another at the shops. Not any longer!! I packed them all up into a cool bag and have them in the boot of my car so that, like you and others, I have them with me when I go to the shops. Feels good to be prepared. I have an almost identical set-up - 1 handbag with an Envirosax and an assortment of calico carry bags and a hessian tote. I detest the 'green' bags and steer clear of them. It is interesting that some of my calico bags were actually bought from Coles and Woolworths before the green bags were introduced - they have lasted well over 12 years and will continue to be used for many more. I also have a bag of reused paper bags that I use when I buy dry goods from bulk bins and tulle bags that I made which are used for fruit and vegetables. I laughed at your comment about the huffing and eye-rolling of shop assistants. The responses I get now are generally very positive when compared with the antagonism faced by we loonies who chose to refuse plastic packaging over 20 years ago. I actually had a stand-up argument with a shop assistant in a department store who insisted that it was essential that I accept a carry bag for 1 pair of socks that I was buying for my husband. When I challenged her, the only reason she could give was (in a roundabout way) that no-one would know that I had shopped in their store and that I was denying them the free 'advertising' that they had come to expect. I am sorry, but that is not why I bought a pair of socks!! It is a constant battle to refuse additional packaging (particularly plastic) in all of its guises. However, it is a cause that I am absolutely passionate about and I would encourage others to think carefully about how you can change your shopping habits. Your actions do make a difference. The site of my story about the socks was Adelaide - capital city of the only Australian state which now has legislation banning the use of plastic supermarket style bags. As far as I am aware that legislation has not killed anyone and I hope for the day when it becomes national legislation. South Australia is also the only state with container deposit legislation. Thanks, Rhonda for raising this issue. SA may be the only complying state but the ACT is in there too as a complying territory. We have had a ban since 2011. Sometimes I get a little defensive of Canberra: we're not a faceless city of fly in/fly out politicians and I'm very proud we already have our ban in force. That is great, Sara. I was unaware of the ban in the ACT even though I have been there a couple of times (and shopped) since 2011. I guess it did not impact on me since I always have my own bag. There will be incremental change and discussions like this can only help. Rhonda, you would probably remember the situation in Germany. I lived in Hamburg in 1987 and the local Aldi supermarket charged 10 Pfennig for a bag if you didn't bring your own, way back then. I ditched the green bags ages ago and even the hessian bags for as nice as they look, they don't wash well at all. I stick with calico and cotton for my main shopping bags and I have a few which roll up very small for my handbag and car glovebox. I keep some in the car and hanging up on a hook just inside the pantry door. Like organisedcastle above, I still have some calico bags I bought before the green bags were introduced. It's a habit like many other things; at first one may forget to grab them up before leaving the house but a few trips where the only option is to buy new bags or take plastic will help jog our memories to become more organised and take our own bags next time. In Ontario, Canada they have been charging 5 cents per plastic bag for a few years. I had already been using reusable bags, so it wasn't a big deal to me, but there were lots of people who complained. Now, everyone is in the habit of carrying their own bags. It just seems to take a while for people to adjust. Like a few others, I usually get raw meat in a plastic bag (and pay for that), but reuse the bag to line garbage containers. I made a really cute reusable bag from a pretty vintage pillowcase (doubled up). I'm sure the pattern is out there if anyone is interested. where are the large brown paper bags we had once up on a time? But we take our trolly to the car, then pack our shopping in the Luggage compartment of the car. Other times we take our own bags. For those commenting about bin liners (i.e. using old plastic shopping bags as bin liners) I have to ask why are we compelled to line our bins at all? It's really no more difficult to carry out a bin and empty it into the big bin than to carry out the bag lining the bin. If you compost then most of the rubbish will be dry waste so it's not messy either. Like others I carry an envirosac and a string bag in my handbag. I also have another little fold up bag that lives in the bottom of the stroller and a cupboard of larger fabric shopping bags for big bulk shops. I also invested in some nifty little mesh drawstring bags to replace the thin plastic bags provided to purchase fruit & veg. They are fantastic as you can wash salad leaves etc in them too. It's funny to think there was a time before plastic bags were invented and society coped yet now some people still can't get their heads around it! What a good reminder to be aware about the plastic that we use, I have 1 or 2 envirosaks in my handbag for general purchases, even op shop finds, and also a few calico bags that are 12 years old for grocery shopping, they stay on the front seat under my handbag, so I don't forget them. If you accidently do your grocery shop without bags, just repack into the trolly, then load into your bags in the car or place it all in the boot (trunk). If you fold the shopping bags and place under or on your handbag, sometime during the week they will make their way back to the car. I think it all comes down to habit... we don't go shopping without our purse, so just make it purse AND bags. I think it has to start in the training of checkout people to ask "do you have a bag?" lots of shops here are doing this now.....sadly, not the supermarkets. I live in Adelaide so the ban has been in for a couple of years now. I used to work in a supermarket located near a big caravan park so I was always careful to remind people that the bags cost 15 cents as many holiday makers do not know. It gets mixed reactions and I notice many people will buy as few as possible. I fully support the idea my mum used to use these huge big shopping bags similar to Ikea bags about 20 years ago and refused to buy anything separately packaged. As a child it was quite fun but as a teenager when you went down a checkout that a classmate was working it was quite mortifying. This is a topic close to my heart, I have been using my own bags shopping for well over twenty years and used to still have some 'country road' bags. They are strong and can fit as much as you can physically carry. A few years ago we had a house fire and most of mine were burnt and I have only been able to find one replacement so often use the 'green supermarket ones'. I found the Country Bags easy to wash in the washing machine and lasted until they burnt some close to twenty years. On the weekends when I attend the local flea market for fruit and vegetables and any other treasure I find I use a shopping trolley (I think someone else said a rolling cart) and when I buy a few pears or oranges, they are weighed and put straight in my trolley. I walk five days a week for exercise and often pick up plastic shopping bags and fill them with litter on the roadside and then put them in a bin. In my earlier days of taking my own bags it was a race to beat the assistant to putting the groceries in a plastic bag. The odd plastic bag I get or pick up was used as a liner for my bin. At present I am holidaying in the US and bought one of my country road bags with me for when we doing the shopping. Thanks for listening to me on the topic. I agree that you have to be quick at the supermarket to stop the cashiers giving you a plastic bag. I've noticed when I tell them I don't need a bag and they take my one or two items out, they often stuff the bag under the cash register. This suggests to me that it just gets thrown away instead of reused, and kind of defeats the purpose of refusing it! I usually use the green bags, but I only have a few and have been using them for years (a lot more than 30 times each). I think I will try replacing them with more natural fabrics as they wear out. I now have a beautiful woven basket from Africa to carry my groceries as well as other cloth bags. It is such a beautiful crafted article that I love to carry it around with me, And it's a more obvious statement than cloth bags and will hopefully get more people thinking even if it is just to roll their eyes. 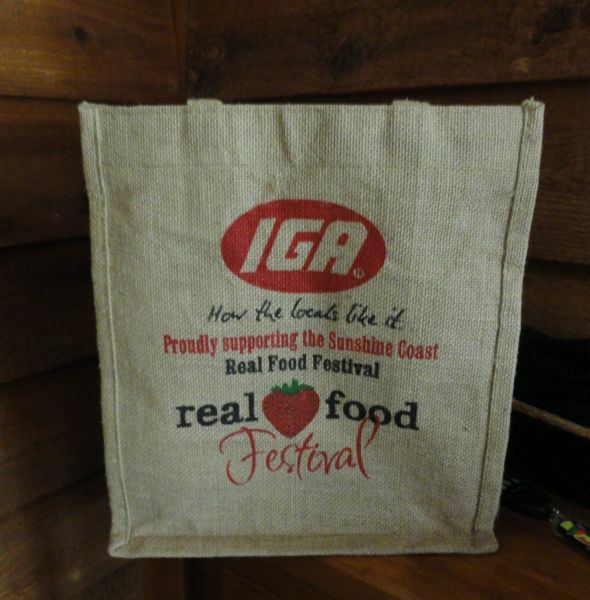 At my local IGA they know me and are quite happy to use my bags. Hi Kate. I have a few baskets and always take one with me to the local markets. LOVE the basket. I never believed in the power of government until I lived in Dhaka, Bangladesh off an on between 1999 and 2005 (which is incredibly ironic). When I first went there I was aghast at the environmental pollution and thought that there could be no solution.I was away for one year in 2002 and when I returned the government had banned 2 stroke auto-rickshaws for compressed natural gas which meant I no longer got toxic poisoning every time I travelled, and secondly, had banned polythene bags. In every shop the only bags I could get were thin jute ones. The effect on waterway pollution was clearly visible. I heartily agree!!! I NEVER take plastic bags and I have gotten good at parrying all responses. There are some cashiers out there who think they are being kind and generous when they insist I should take a plastic bag. When moving house recently, I found we had "hundreds" of "Green Bags" and also plastic bags. Enough to last a lifetime! I once commented to a checkout operator that not many people use their own bags anymore and rely on the plastic ones supplied. Her comment was that she thought it was a good thing to use the plastic ones supplied by the supermarket as she had experienced putting her hand on a dead mouse in one of the "green" ones and also that some customers do not wash them between trips. Hence smelly!! Broken eggs and chicken juice must be washed out before they are used again!!! Interesting perspective. By the way, I read your blog even before the news every morning!!! Love it. There's also a good photo tutorial here on making your own shopping bags: http://www.craftster.org/forum/index.php?topic=177482.0#axzz2dE1bMCdM I bought a second hand single bed quilt cover and got 5 bags from it! Ah, if I could just avoid the supermarket altogether! ;) Actually, we're getting closer to that each year! And someday I'm certain I will cancel my trash service, as we really don't produce that much. I love how you state straight up that it's not that hard to take your own bags, because it really isn't! I keep one or two in the bottom of the pram (we walk everywhere) for grabbing milk or whatever, one in the car just in case and I take a bunch with me on my fortnightly shop. It becomes habit. They are also good to use for non-grocery items too, like when buying clothes etc! I make shopping bags from old worn sheets, add a little pocket to the front so that they can fold down small and fit in your bag like the envirosacs. I've also added a little hook at the front to make it easier for the cashier to hook the bag over their bag frame to stay open. I've just finished reading "Plastic Free" by Beth Terry. Reading what happens to plastic bags (like people finding dead birds with dozens of bags rotting in their stomach and intestines) just makes you want to cry. It makes me want to cry too, Melissa. I just wanted to tell you that I love your little hook for the supermarket frame. I'll use that idea from now on. Thanks love. It's funny how you miss the simplest of things sometimes. Like others have said, I need to line my kitchen bin with a plastic bag. I do this so I don't have to wash the bin everyday and the big wheelie bin weekly. So I'm saving water which is also envirmentally friendly. If all supermarkets provided biodegradable bags then we'd all be happy. Such a simple answer yet so few supermarkets will help this cause. I am also from South Australia. Most folks have adjusted. The first thing on the conveyor belt at the supermarket is the bags. Then the groceries follow. I remember Mum taking a big woven basket to the store to do her grocery shopping at our country general store. I hate to see the plastic bags blowing around and I see plenty of plastic coming in on our beach. The one good thing here in Hawaii is that the plastic bags put into household rubbish go to the HPower...where they burn all our rubbish to make electricity. Better than importing oil to burn for power into our island. Shopping at ALDI has taught me to always have my shopping bags in the boot!! Nothing like getting to ALDI & realizing you have forgotten them & you live 1 1/2 hrs away!! A good lesson in being organized when I go shopping. I also carry a folding one in my handbag but have to confess I often forget it's there. I will continue to try to remember. Thanks again for a great post. Here´s the situation in Sweden: I´ve lived here since 1976 and I can´t remember plastic shopping bags ever being free. Those little ones for wrapping frozen foods in are free. I sadly also have no memory even that far back of staff ever helping to pack your purchases - a great way for kids to earn a bit and learn a bit about customers. Recent years: at our local supermarket you can buy an enormous, strong canvas shopping bag or various sizes of plastic reusable bags as well as cotton bags. On our big shopping occasions we use 2 of the canvas biggies if we are using the car. After a couple of years the handle broke on one so I sewed on new ones. Since about 5 years back, our store (most of the biggest ones nationally) offers a system whereby you go round with a hand-scanner and scan the barcode on the items you purchase. You begin by scanning your customer/cash card. Checking out, you scan your customer/cash card again, replace the hand-scanner in the stand, then check out via a machine which draws the amount from your card and gives you an itemised receipt. Random spot checks can occur at any time. There are plenty of these stations around so you never have to queue up. Since I hate supermarkets and can´t wait to get out that suits me fine. We have no choice, this is our nearest shop even though we have to take the bus lugging our trolley bags, or occasionally car. Our local shop had to close down when this supermarket opened. I think this situation explains partly why I travel as often as I can to France. All those little Artisan shops are just heaven to me. Hi Rhonda, only the second time I have commented, and like a lot of the others, a subject close to my heart. My answer to the plastic bag giveaway at the check-out, is to refuse, re-stack said groceries etc. back into my trolley, take trolley out to the car and unpack into cardboard boxes, which I reuse over and over, until they are no longer viable, then the recycle/compost gets them. I have never had any trouble asking at either the supermarket or the fruit shop for replacement boxes, and if I just happen to get any plastic bags, I return them to the supermarket for recycling. I also carry quite a few bags of all sizes in my car for those times when I just grab a little something somewhere. On a side note - I work weekly in an Op Shop, and we receive quite a lot of stuff packed into reusable bags of all sorts, so we made a conscious decision to put the clean, usable ones into our shop to be given free to our customers to carry home their purchases, instead of using the plastic bags that we used to get donated to us, by doing this we have greatly cut the use of plastic, and some of our regulars refuse any bag, particularly the plastic ones. From November here in Tasmania, the humble plastic shopping bag will be extinct. We have so many brilliant incentives in England to make us want to use our own bags, supermarkets give extra points on their reward cards and we have posters that tell us how many bags we have used less each year and some shops have started to charge for each and every plastic bag they give you (even charity shops). But there are of course folk that still leave the supermarket with a trolley ladened with plastic bagged shopping, and seemingly not a care in the world. The type of 'green bags' that we have in this country are usually made from re-cycled plastic drinks bottles so are a good strong, slightly more environmentally friendly alternative. Doggy Poo Sacks here are now usually made from a biodegradable type of plastic which is so much better than them being made of plastic that does not rot. Me, I use my own hessian or cotton bags which I store in the boot of the car so they are always with me, and if I forget to take them into the store I simply bag up in the car park instead. And like you I have a large tote that folds up small inside my handbag that I am quick to whip out before any cashier bags any shopping that I do. While I agree in general, and indeed in my country we have to pay for plastic bags in the supermarket, I have to say that I personally use the free simple white bags as garbage bags in my kitchen. So whether I get them at the market with my groceries or whether I buy them in a roll as trash bags, they don't get wasted. Also I keep a number of bigger plastic bags in my car boot, so I have one handy should I need one. I never use a plastic bag just once. I've been using my own shopping bags for many years now and just want to say a quick word in support of the ghastly green bags! Yes, they are made using the same sort of plastics as the single use bags, but my two bags have lasted me about 12 years now and show no signs of giving up yet. They are also by far the sturdiest design I have come across and I've had comments from a few people while living in the UK about them, asking where they can get them etc. In Portugal, it is very hard to get away from produce bags, the sort you put fruit & veg in. In most supermarkets, the produce is weighed at the produce section and a price sticker put on before you then take it to the checkout to pay. We are happy to have the sticker put straight onto the bunch of bananas, but it appears everything has to go in a bag first and the sticker then put on the bag. If we don't do it, the staff will. So, we save the bags, peel the old sticker off and re-use them next time we go. One day, our Portuguese will be good enough that we can have a conversation with the staff about not needing to use a bag every time, but we are not there yet. Lining our bins will also be an issue for us. We don't have individual household rubbish bins - instead, there is a communal bin on each street and you take your rubbish out to that. The council asks that all rubbish is bagged/wrapped, presumably to reduce the mess that loose rubbish could make. We don't buy newspapers, so can't wrap in that..... We'll have to think of something! In Wales it's already the law that shops have to charge if they supply you wish disposable bags - and I can see England not being far behind following! I too have my small fold-up shopping bag tucked away in my handbag, and then each of our cars has a hessian tote in the back filled with a variety of other bags from cotton totes to the plastic heavy-duty "bags for life" that some of the supermarkets sell. (Those are great - you pay 6p-10p for the bag initially, but then when it finally fails on you they replace it free of charge. It's perfectly possible to get years of regular use from one of them though). I also re-use the paper carriers that the bakers give us, and even the paper bags from the individual loaves on the occasions I buy them, get re-used. Earlier this year I made a couple of strong canvas shopping bags from some curtaining remnants and they hang right by the front door above the keys. It's now habit to pick one up as I leave the house. My local greengrocer doesn't offer me a plastic bag any more, he just puts the produce straight into my canvas bag, although I keep meaning to make some small netting bags to take with me so this is a good reminder. Like many others, we have a stash of bags in the car for supermarket shopping. I know Lidl here has been charging for plastic bags for some time and I have often wondered why other supermarkets don't. That's something I may look into. No plastic bags, no problem...They are already banned in South Australia. We always have to take our cloth bags or we have to pay for plastic ones! Since I was born and raised in Germany, I'm very familiar with having to pay for plastic bags. Pretty much everybody owns many, many cloth bags and takes them to the grocery store. I have brought a nice selection with me to the US and I've also made a few myself. They are always kept in the car, so there's never a need for me to get a plastic bag. I work for Dan Murphy's (even though i hate woolies!) & we went plastic bag free about 3 & a half years ago, we supply paper bags & cardboard boxes to carry purchases in. I am still abused by angry customers every day due us not supplying plastic bags, we have had many customers refuse to shop with us until we bring back plastic. People have become so dependent on them that they don't think they can manage without them. They may even have a trolley full of other groceries but they want another bag! They often exclaim 'how do you expect me to carry this?' When I tried explaining to an elderly gentleman how bad plastic bags were for the environment he said 'i'll be dead soon enough so it won't affect me' That is the attitude of so many people. OMG I'm sure I'm going to scream at someone soon when I see them placing a bunch of bananas into a plastic bag....why!!! I'm from Ireland and it's amazing how when you're suddenly asked to pay for something you realise just how much you took plastic bags for granted. Now it's really rare to ever see anyone buying a plastic bag, students use backpacks to carry groceries and families etc use reusable bags. I've moved to the USA (South Carolina) and I'm amazed and horrified by how many plastic bags I'm given. Cashiers look at me like I'm crazy when I produce my own bag or just say I want to carry my items without a back. Perspective is a powerful thing. I struggle with the cloth bag thing. I've used them..I made some lovely ones from heavy outdoor cushion canvas. And I forget them. The store clerks struggle with them because they don't fit into their packing spots. They put a few items in the bottom and switch bags. And on and on. I use them mostly when I go to Aldi where I can pack my own bags. (I'm from the era when there used to be bag boys that didn't bag by alphabet -- packing bread with bananas for instance). And then I saw reports on how dirty carts are. (diaper contents dirty) I wrecked a set of bags the stores sell by washing them because they were very cheaply made. I even got a set of crochet looking bags, stretchy things. The clerks couldn't start to cope with them. Drives me nuts. So I've settled for now on this. I bag paper when I get to and take the plastic otherwise. I found a small kitchen trashcan that works with these little bags and use them for trash. And cat stuff. At least I'm not buying more bags for trash. Both of our major stores have bins in the front to bring back your plastic bags to recycle. I don't believe either sell their own cloth bags anymore. What goes around comes around. When I was young everyone in Canada carried their own shopping bags or baskets. Even in the 1970s when I was living in Europe people carried their own bags - net shopping bags being the most popular. Then everyone switched to depending on the stores to provide the bags. First paper and then to plastic and then people began to worry about the environment so every grocery clerk used to sing song "paper or plastic?" All of this was done for the purpose of advertising. I remember ordering bags for the huge department store where I worked during my school years. The quantity and the price was just ridiculous. And the speed with which we went through them quite mind-boggling. And the world wide pollution that these plastic bags have created - blowing on the wind or gyro-ing in the oceans is just so depressing. You hardly expect a plastic grocery bag to go blowing past you when you are just a few kilometers away from the north pole. And when we caught it we were stunned to see that it was from a store that had gone out of business about 10 years before. We have not used plastic shopping bags in 0ver 14 years. When we moved to the far north we learned that garbage and its disposal is a very serious thing. We started with cloth shopping bags and then moved to plastic shopping bins that we could buy from our grocery store. They were designed so that 5 bins fit into a shopping cart (trolley). The stores still provided bags for those who did not bring their own but 5 years ago they began charging for the bags. And 2 years ago they started crediting anyone who was bringing their own bags with a cash credit. The minimum is for 3 bags so a credit on your receipt of 15 cents. We estimate that we have not used 3000 plastic shopping bags over the past 14 years. And we have never missed them at all. Interesting post and comments. Here in the UK most supermarkets will still offer free plastic bags, but they are made from biodegradable plastic. After a few months they just shred into tiny little pieces. Aldi and Lidl charge for their bags. I have a wheeled shopping trolley with a couple of jute bags and use that for our groceries. I always try to avoid free carrier bags where possible. In my part of the UK, we have weekly kerbside refuse/recycle collections. We have pink bio plastic bin bags for all recycle-able plastics, cardboard, aluminium, newspapers/magazines, textiles and steel. Food and garden waste is put into a wheelie bin for recycling. Our local council recycles this into compost which is then sold to garden centres, etc. Glass is collected on a fortnightly basis. The only thing that gets sent to landfill now is stuff that can't be recycled which is very little. What really annoys me is that even with all this amount of kerbside collections, there are still people who just cannot be bothered to recycle their refuse and just chuck everything into black sacks. It really doesn't take much effort to sort it, but what can you do? Some people are just lazy. Our recycling center bought one of the Japanese Plastic to Oil machines that converts all plastics including bags back to oil. They have been using it for a year now and not only have not had to buy any oil for heating but are selling it. Just wonderful. The center even paid the school kids for every kilogram of plastic that they could bring in to pay for sports and music activities. I bought a shopping basket with leather handles about 9 years ago from our local market, it's still going strong and looks as good as new (but with worn handles). I can't imagine how many plastic bags this has replaced. In France, supermarkets don't give out plastic bags but sell the for 0.03ctms. I'm happy to see that most people now bring their own reusable bags. Our local organic supermarket leaves old cardboard boxes and wooden cartons for people to use for their shopping. I save mine up and use them to start the fire in the winter. The ACT is one of the places in Aus that has banned plastic shopping bags and there is a cost incurred if you want to use one. It has made me more thoughtful and I most usually take bags with me and try to leave some in the car for the Mr. I love the idea of using cloth bags. I use them and baskets when I shop. There are some additional things to take into consideration when doing so. You should not mix meat and vegetables or fruit in the same bag. Also, you can get food poisoning from the juices of meat,poultry ect left behind in the bag. Here is a link to just one of many articles discussing this issue. American here who just moved out of New York City and I need to request a correction -- I don't believe that people are now being charged for bags in NYC. It's been *proposed* but the bill will have to get passed, and that is absolutely not a guarantee I'm afraid. Now, I moved to a Maryland a few months ago, and here we DO get charged for plastic bags (only exception I've found so far is the is the farmer's market, which... ARGH). And it makes such a huge difference in people's behavior. Here is it totally normal to use cloth bags, no one blinks an eye. In NYC, I got the "yeah, you're one of *those* people" look. All the time. As everyone has pointed out, it's so simple -- keep a compact one in your purse, and keep a stash in your car for the 'real shopping' trips, and it's easy. As soon as I unpack anything at home, I hang the bag(s) back on the front door so I don't forget to throw them back in the car the next time I leave the house. I love not having to store and recycle plastic bags, and even more I love that it's taken for granted here that people will have a reusable bag. I do have a lot of those horrible 'green bag' type ones. They were given to me, or purchased before I knew better -- and so I will use them until they are no longer usable and replace them with ones made of natural fibers. No sense in wasting them! Hi sewerrat, I'm sorry but I can't change what they report in The Guardian. Maybe an email to the editor might do the trick. I agree with you about the green bags. We have them too and I'm not disposing of them simply because they're not environmentally sound. I would never buy new ones but I'll get rid of these when they can no longer we used for their purpose. Hm, ok, I just thought that link in The Guardian only said it was a proposal, too: "New York City is the lastest to propose a small fee on customers asking for plastic carrier bags instead of bringing their own." I reread the article sewerrat and you're right, it was a proposal. I corrected my sentence. Thanks for persevering with me. It's not only the plastic grocery bags that end up in landfill (& other places they shouldn't), but also plastic lunch bags (my niece & nephew get their sandwich in a fresh one each day, which is inside their lunchbox.... go figure), large plastic bags from clothes, white goods, small appliance stores, & believe it or not 800 million "disposable", ??? biodegradable nappies go into landfill in Australia each year. But that's a whole other debate/can of worms, so don't get me started on that one.... we all have a conscience, it's just that some people choose to push theirs to the back of their mind into the frequently used section. You might be thinking "to each his own" or "different strokes for different folks", but this earth belongs to each & everyone of us & therefore each of us has a responsibility to care for it the best we can....... & sometimes that's not going to be what's convenient! So how does everyone keep their kitchen bins clean if they are not using plastic bags to line them ? I don't buy newspapers so that's not an option. Washing the bin on a daiy basis uses extra water - also not good. I take a fabric tote bag (made by a good friend) to town for all the bits and pieces I might have to buy, apart from groceries. At the Foodworks supermarket that I frequent, there are empty cardboard boxes on shelves near the checkout, and I use these for my groceries. At home, the boxes are used as fire starters (I cook with a combustion stove) or as weed supressers on paths in the vegie garden. I do ever use/accept plastic bags. However, I do use freezer bags to divide meat I buy in bulk. Any suggestions how to get around this? Plastic containers are an option, but very bulky in my tiny freezer. What about reusable snaplock bags? Give them a wash and use again. Hi Rhonda. The are so many things out there that are designed to be single use: soft drink bottles, cling film and plastic cutlery. I even wrote about plastic cups tonight. The amount of it all makes me feel so helpless. My local butcher/fishmonger/greengrocer/deli gives you a 5% discount in you bring the canvas bag that they sell. It's $3.50 to buy, and I've had mine for ages now, and still looks as new. I've even washed it without any problems. What baffles me though, is that I hardly ever see anyone bringing the bag! 5% (except for on dairy) is quite substantial, enough for me to make sure I always have the bag! I love using my own bags. We have lived way too many places in the states due to a military career -- and I have been stunned by the amount of bagger/checkers that are borderline rude when you use them. I guess its quicker and easier for them with their set-ups to do the plastic? Whatever it doesn't stop me. I agree with this. Plastic bags are always harmful for health and that is why it is advisable to use paper bags or fabric bags which are available in the market in various styles, colors and combination. Really Good info ! Sports Bags Australia . Plastic bags are useful in many ways like in shopping we carrying a lot of things it also helpful for storing different things. 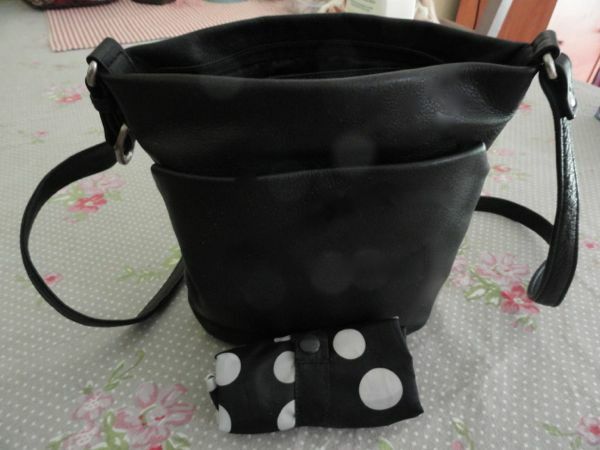 Thank you for sharing the links about making your own bags. I use bags currently, from a local store that are made here in America, I've been looking for a source that makes ones with variety, here in America for a reasonable price. I found one, thanks to your post. ME!